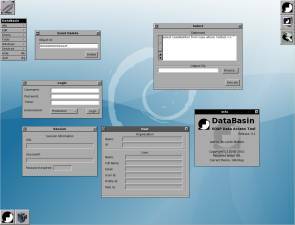 DataBasin is a tool to access and work with SalesForce.com. 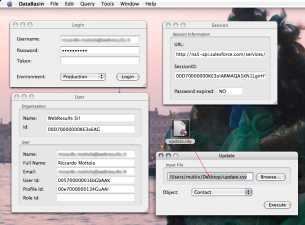 It allows to perform queries remotely, export and import data. 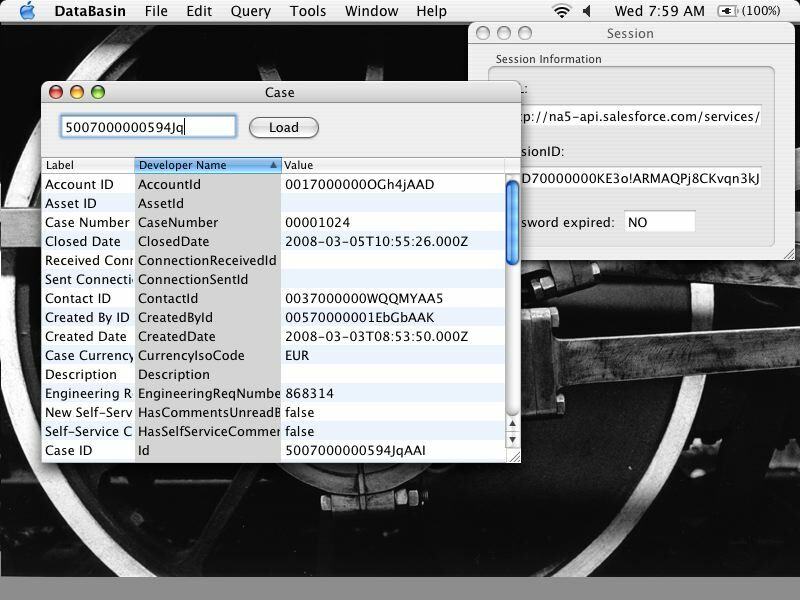 To connect to Salesforce.com, DataBasin uses the WebServices exposed by the SFDC API and exposes them as methods of the DBSoap class. 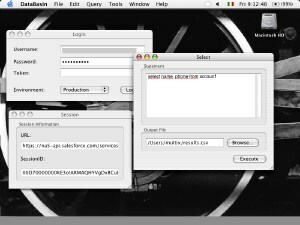 To send and receive the SOAP messages, DB uses the websevices (GSWS) available from GNUstep libraries and which is a mandatory requisite. 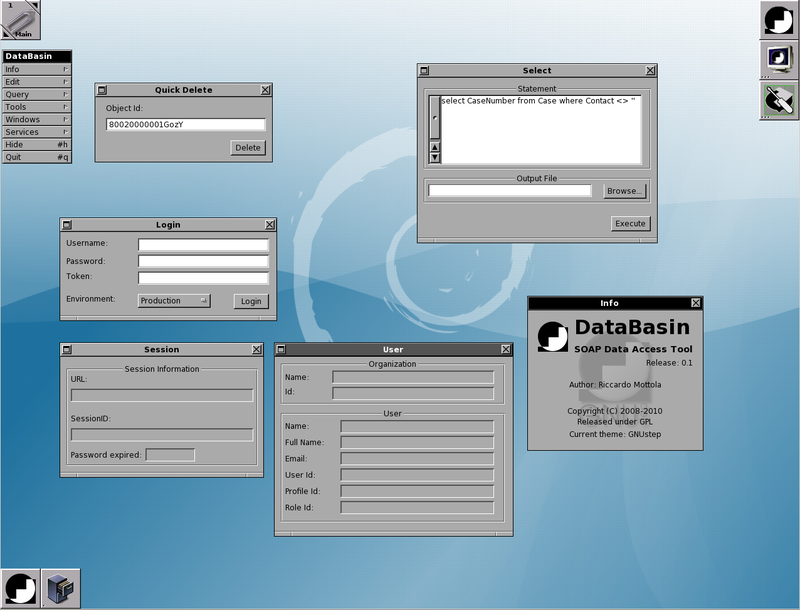 Access to the SFDC API is provided by the framework DataBasinKit which constitutes the core of DataBasin and is available for building other Salesforce.com connected applications. 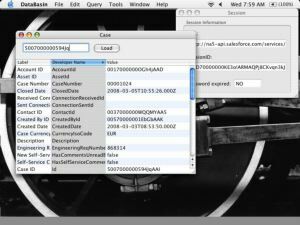 DataBasinKit allows you to access Salesforce.com from any Objective-C app using GNUstep or on MacOS. The DBSoap core has been extensively rewritten. It supports now operation through the usage of the DBSobject. The core supports describing of object and the query operations now support methods to input/output object arrays instead of just file writers/readers. The core supports now selection of character encoding. "Describe Object" allows to save a CSV file with the object description. Very useful for comparing configurations. Preferences to select the desired character encoding with file operations. 0.3 on Mac: The Object Inspector. The workspace as running on Macintosh. 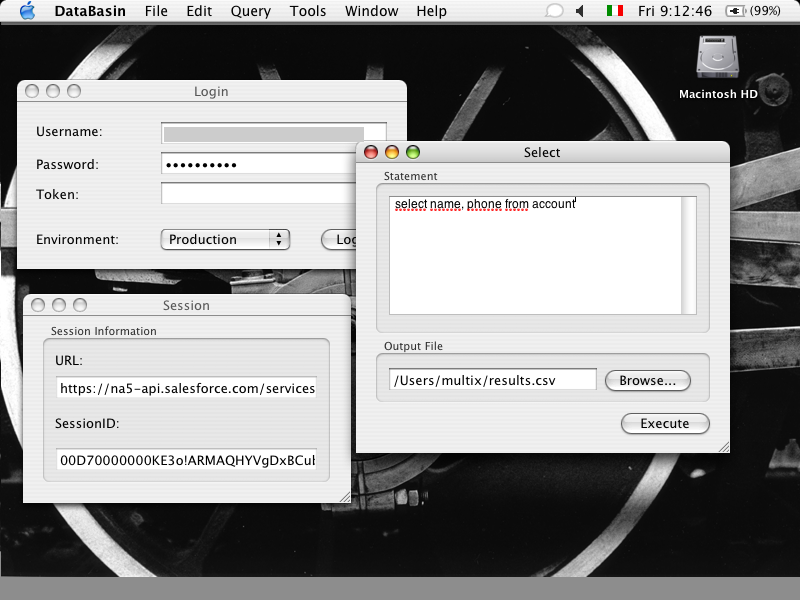 Visible are the log-in window, the session inspector which gets populated after a successful log-on and the panel to run select queries. In the other screenshot more session information is now shown as well as the update pane.